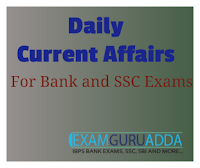 Dear Readers, we are presenting Daily Current Affairs for All Exams- 11th December 2016. 1. China has successfully launched a new generation weather satellite which will significantly improve the country's weather forecast capabilities. 2. The Fengyun-4 satellite, the first of China's second-generation weather satellites in geostationary orbit to have been launched, is also the country's first quantitative remote-sensing satellite in highest orbit. 1. Virat Kohli on Sunday created history as he became the first Indian captain to score three double hundreds. 2. The 28-year-old's double century against England on the fourth day of the fourth Test at the Wankhede Stadium in Mumbai was more than just a classy knock. It was attestation of his class and form. Above all, it decided, once and for all, who is the best batsman in the world now. 3. Three double centuries as skipper in the same year - in the West Indies, against New Zealand at home and now this -- is something amazing. He is the first Indian and the fifth batsman overall to score three double tons in a calendar year. 1. President Pranab Mukherjee today marked his 81st birthday at the Rashtrapati Bhavan by launching a campaign to end child labour, child slavery and violence against children. 2. Mr Mukherjee launched the '100 Million for 100 Million Campaign' organised by Nobel laureate Kailash Satyarthi's Satyarthi Children's Foundation in which about 5,000 children participated. 3. The President said he was delighted to launch the campaign led by Mr Satyarthi from Rashtrapati Bhavan, "an institution which symbolises our Republic's commitment to democracy, pluralism and secularism". 1. Paolo Gentiloni was named Sunday as Italy's new prime minister following reformist leader Matteo Renzi's resignation in the wake of a crushing referendum defeat. 2. Gentiloni, who had been Renzi's foreign minister, was asked by President Sergio Mattarella to form a new government that will guide Italy to elections due by February 2018, a presidency spokesman announced. 3. Gentiloni, 62, is seen as a close ally of Renzi who is unlikely to get in the way of the outgoing premier's plans for a political comeback.